If you’re a? ?burger lover, you might like this. There’s this popular place in Victoria, Melbourne, Australia called Cafe 51? ?that offers free burgers for a lifetime to anyone who gets a tattoo of one their tasty burgers. A bit extreme isn’t it? Just pick your favorite burger, get it tattooed and get a burger for free every day in this restaurant. Tattoos are for life, so why shouldn?? ?t burgers be free for life too, right? This competition? ?is called #freeburgersforlife? ?and there are a few rules that you must follow in order to qualify for it. You? ?must present your ID when you? ?sign in. The limit is one tattoo per person. By? ?agreeing to take part in? ?this promotional campaign,? ?you also agree to be filmed or photographed for promotional purposes that can be posted online or in print by #burgerloveAustralia. You? 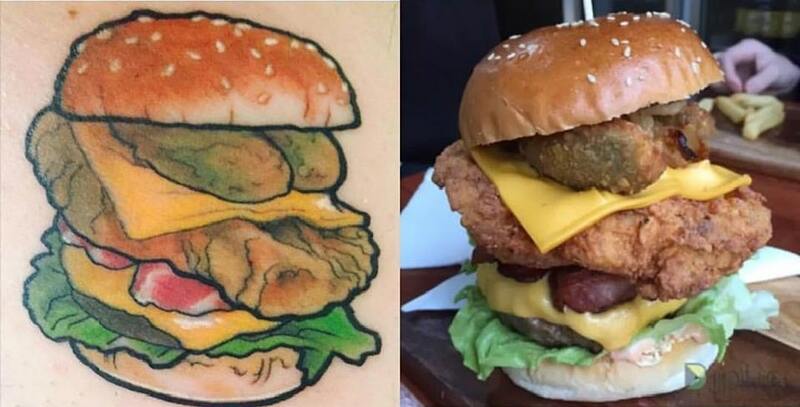 ?will pay for your own tattoo of the exact burger you pick from the menu. You? ?will be able to redeem only one burger a day and only the burger that you have the tattoo of. You must hashtag??#burgerlove? ?in your uploaded images. This is the form that you need to fill in order to apply for this promotion. Registration will be available till the end of the October. ”To date we’ve had over 3000 applicants,” said Steve Agi, co-owner of the Cafe 51. He also said that they thought of? ?this idea after they noticed that some people already had burgers tattooed. “They come in and? ?roll up their sleeve or lift up their? ?shorts leg. They? ?already did it without us having to ask” he said. ”Never expected such a massive response but I guess it’s testament to how passionate people are for our burgers” Agi added. Initially, the cafe? ?had plans to select 10 winners but now they are rethinking the plan since ? ?many more people applied. There? ?would be too many people for the business? ?coming in everyday to redeem a free burger. ”We were talking? ?about limiting it to??10? ?but given that it only? ?went live last??night? ?and we? ?are planning to take registrations for all of October, it may blow? ?out to a little bit more.? ?We will see? ?how things go.” Agi told The Weekly Review. Applicants can choose from the smallest burger on the menu to the biggest one. The smallest one is the regular mini burger that is about 7 cm in width and 4 cm in height. The biggest cheeseburger? ?is the Hulk burger that Agi? ?claims can ”feed a small village” lol.